These cabinets offer convenience, flexibility and mobility. Contents remain secure yet fully visible. 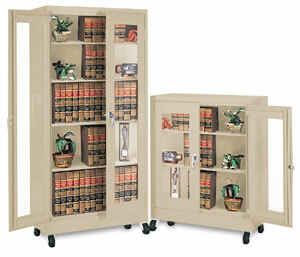 Constructed of heavy gauge steel, each shelf has a 200 lb capacity. Features two chrome handles, a three point locking mechanism and four 5" casters.